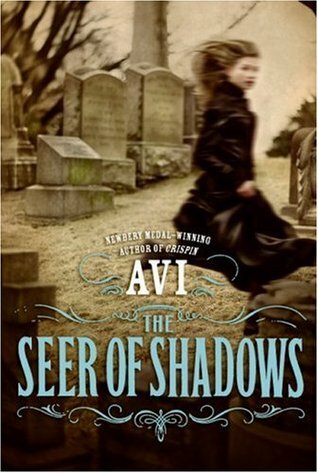 For February’s Book Club, we read The Seer of Shadows by Avi. Harry and Cameron were present and Andreas participated virtually. We had a truncated meeting but Cameron and Andreas both seemed to really enjoy the book. Cameron mentioned that the book is a good mix of suspense, creepiness and historical fiction. Andreas went so far as to write"I LOVED THE SEER OF SHADOWS!!!!!!!!!!!!!!! It was so good that you felt like you were a spectator and I really liked how Mr. Middleditch actually used people's thoughts to get advantages. Avi is one of my favorite writers and you made a great choice!!!! Ps- sorry about the caps. I just wanted to show extreme happiness. :)"
Although we had short meeting this month, we did watch book trailers for options of upcoming Book Club selections. The members enjoyed them so much that we decided to read almost all of them! So, we have the next three months of Book Club selections picked out. Yay us! Wednesday, March 6th: Liar & Spy by Rebecca Stead. Wednesday, April 3rd: In a Glass Grimmly by Adam Gidwitz. Wednesday, May 1st: Starry River of the Sky by Grace Lin. All meetings are held at 3:00 p.m. and include good conversation and a snack. Interesting Note: Did anyone notice that all of these are repeat authors for Book Club? Liar & Spy is unrelated to When You Reach Me, while In a Glass Grimmly and Starry River of the Sky are "companions" to A Tale Dark and Grimm and Where the Mountain Meets the Moon, respectively.